Summer Place Baguio, must be the biggest rooms in Baguio! 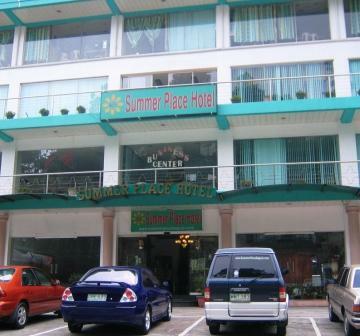 Summer Place Baguio great value accommodation. 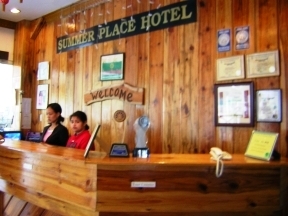 The Summer Place Baguio is reported to be "the first fine boutique hotel in Baguio City". It is a 10-storey building amidst a setting of towering pine trees and gently rolling mountain slopes. The hotel is 4,600 feet/1,400 m above sea level. It is just one of Baguio's most popular three-star hotels, which offer spectacular views and breathtaking scenery of the city, a dramatic and romantic touch of sunset, with a glimpse of South China Sea. At the Summer Place Baguio, you can take it all in through a panoramic window, all while relaxing in spacious rooms. European, Asian and American influences with modern facilities are reflected in the design and decor. Where is the Summer Place Baguio? It's pretty hard to miss as you pass by Marcos Highway. You can always ask the bus to drop you off right in front of the hotel, which they are more than happy to do. Aside from its excellent hotel accommodation with a variety of rooms to suit every guest, they offer complimentary breakfast at the 'Buffalo Steak House', you may also catch up on your workout at the 'Power Gym' or have a masseur room service while leaving the kids to enjoy and play at the 'Kids Station' and watch cable television. There is even a '24/7 Supermart' open 24 hours for your convenience. They are also proud to say that they are the only hotel in the Philippines that uses Tempur mattresses – “The only mattress recognized by NASA and certified by the Space Foundation." The hotel’s lobby and restaurant has free Wi-Fi access. Front desk and staff are extremely friendly and pleasant. They also allow late check-out at 3PM. However, the walls on each floor seem a bit hospital-like: no pictures - just white, not really a bog deal I guess just an observation. At night, the hotel is all aglow with bright, cheery lights. They didn't skimp on electricity, so that at night, the building looks very cheerful. There is a visible, but friendly guard who helps the guests and the place seems safe with the 24-hour security in and around the premises. The hotel has 62 suite rooms with private bath and it has been said that they have the biggest room size in Baguio based on room rates and all rooms have floor to ceiling height of 12 feet, so the rooms are big!. Each room comes with cable TV, internet, telephone, complimentary daily breakfast and newspaper, 24-hour hot and cold water. The rooms also have fresh air vents, mini-bar, and a refrigerator. There are huge cabinets for all your suitcases and shoes. The Summer Place Baguio also have a small veranda off each room, but the view is not that great. You can see a stretch of Marcos highway. Small houses are adjacent to the hotel. Is the Summer Place Baguio worth the money? On the whole, you’ll enjoy your stay there. You won’t get a room that big at that price anywhere else. If you are looking for a nice, comfortable place, with attentive service all around you then settle for this one. Room rates start at around US$50 per night. Now I’m not the only one who has been and stayed here, others have been here before, click here to compare prices and read what other travelers have to say about the Summer Place Baguio.